The shark section gets a lot of traffic in my elementary school library. Many young readers are fascinated by the creatures, so I was excited when I heard about Neighborhood Sharks at a Macmillan preview over the summer. 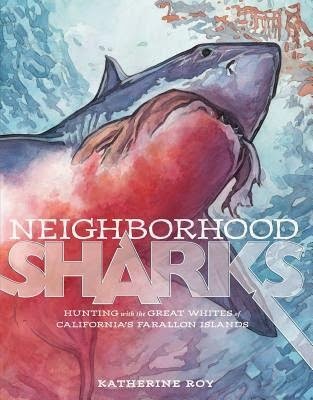 Neighborhood Sharks is not your typical, informational book about sharks. The book focuses on great white sharks that live near the Farallon Islands near San Francisco and includes bold illustrations instead of photographs. The text alternates between narrative and expository writing. After introducing readers to a shark stalking its prey, Roy describes the special features that aid sharks in their search for food: teeth, jaws, sense of smell and more. One page explains how the design of a shark's body is ideal for swiftly swimming though the water. The concept is reinforced in a diagram that compares the body of a shark to the design of a jet plane. Roy's writing style is engaging and the book packed full of important information about great whites. The complex vocabulary, science concepts and illustrations of seals being eaten make this a book for older elementary school readers (grades two and up). 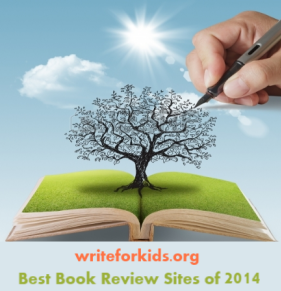 Back matter includes an author's note, list of sources, recommended books and sites, and a map. Visit Katherine Roy's blog for more information about Neighborhood Sharks. looks interesting... imagine having sharks in your neighborhood! All we have are coyotes and bears.